Horizon is fortunate to have extraordinary leaders in Geri and Theresa – two women who play integral roles in helping the company operate effectively and deliver services to the members who count on us for care. Two director-level employees of Horizon Blue Cross Blue Shield of New Jersey (BCBSNJ) have been named as YWCA Tribute to Women and Industry (TWIN) 2016 honorees. The award recognizes businesswomen who excel in their fields and who have made significant contributions to their workplace. For this year, Geri Boone, Director of the MLTSS (Managed Long-Term Services and Supports) Program at Horizon NJ Health and Theresa Ponton, Director of Benefit Coding and Testing, were honored at the TWINS awards dinner in Whippany earlier this month. 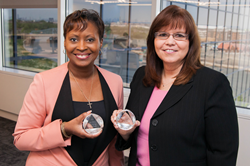 “Horizon is fortunate to have extraordinary leaders in Geri and Theresa – two women who play integral roles in helping the company operate effectively and deliver services to the members who count on us for care,” said Alison Banks-Moore, Chief Diversity Officer, Horizon BCBSNJ. The MLTSS program is designed to promote independence, dignity and choice by allowing certain Medicaid-eligible individuals to remain in the comfort and familiarity of their homes and communities while receiving necessary care. As director of this program, Ms. Boone, who has a Master’s degree in business and a BS degree in Nursing, is responsible for MLTSS product strategy, design, infrastructure and program delivery. Away from work, Ms. Boone volunteers here time in her local community and mentors young people. Ms. Ponton joined Horizon BCBSNJ 26 years ago. She is responsible for ensuring the accuracy and timeliness of group employer transactions, including new member enrollments and any employee benefit changes authorized by the groups. Ms. Ponton obtained her Bachelor’s degree in Business Administration while working for Horizon-BCBSNJ. With a passion for giving back, she is a mentor for high school and college students who work at Horizon BCBSNJ, volunteers for Literacy Leaders in Newark and organizes food drives for a local food bank. TWIN originated in New Jersey in 1975. Now a national and international award program of the YWCA, TWIN annually recognizes outstanding business women and their companies.